Born in Canton, Chen Kuan Tai was one of Shaw's first real, solid trained, martial arts stars that could in essence be considered a master of martials arts by his peers. He landed in bit roles as a martial artist in his first films. Upon signing with Shaws, in 1970, he was featured in Jimmy Wang Yu's "Chinese Boxer". Chen branched out as an actor with his tender roles in "The Tea House" and it's sequel "Big Brother Cheng", both directed by Kuei Chih Hung. These films gave Chen the 'legimate actor' status. 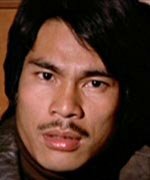 After starring in the boxoffice successes "Challenge of the Masters" and "Executioners from Shaolin", both helmed by the legendary martial arts director Liu Chia Liang (Lau Kar Leung), Chen left Shaw Brothers. One of the only films of consequence he did away from Shaw Brothers was "Iron Monkey", a film he starred in and directed. Chen returned to the Shaw's screen with "Crippled Avengers", "Killer Constable", 'arguably his most powerful drama-martial arts role' ever directed by Kuei Chih Hung, and "The Master". Starring over 80 films and four marriages, he's still going strong and only makes occasional public appearences nowadays.